Anna Bolton | Greene County News Festival-goers will have the opportunity to try all sorts of authentic Indian cuisine at Grand Mela this weekend. Manoj Kumar, Hindu Community Organization (HCO) President; Dahyabhai Patel, Umang Gujarati Association (UGA) member; Pratibha Phadke, Mela volunteer; Kalpesh Patel, UGA Vice President and Gaurang Desai, Mela volunteer, are inviting community members to Grand Mela, 12-8 p.m. Saturday, Aug. 18 outside the temple. The Hindu Temple will also be open for visitors during the festival. BEAVERCREEK — All are invited to Grand Mela: A Festival of India 12-8 p.m. Saturday, Aug. 18 at Om Shanti Cultural Center, Hindu Temple of Dayton, 2615 Temple Lane for food, music, dancing and more. 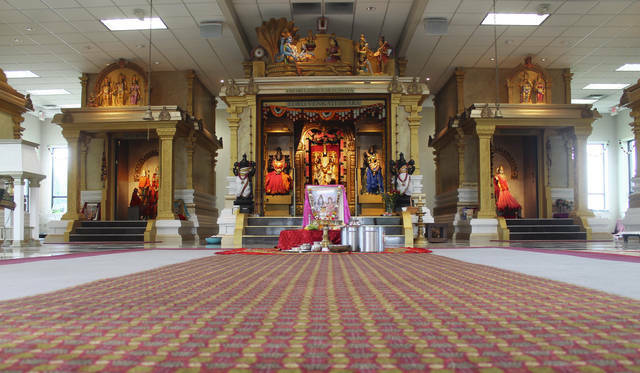 The Hindu Temple, located in Beavercreek, was built in 1985 — the first Hindu temple in Ohio and the only one within a 350 mile radius at the time. Today, the community in the greater Dayton area includes more than 3,000 families. Hosted by Hindu Community Organization (HCO) and Umang Gujarati Association (UGA), the festival began five years ago, inviting all community members to experience Indian culture. It always falls around the same time as India’s Independence Day, Aug. 15. The event boasts perhaps its largest attraction — authentic Indian food. Local families will cook food — found in 18 booths outside on the temple’s grounds — to represent India’s diverse nature. “There is so much diversity in India … Food in the North is different from food in the South, East, West,” Kalpesh Patel, Vice President of UGA said. Visitors might see samosas, rice pancakes, pani poore and more. Tradition will be upheld, with only vegetarian items and no alcohol. Beyond food, festival-goers can also enjoy Bollywood music, local singers, group dances like Garba and Bhangra, Henna tattoos, facepainting and a bouncy house for kids. “The word ‘mela’ basically means connecting with people, bringing people together,” said Pratibha Phadke, Mela volunteer. Along with Phadke, event organizers agreed that the festival represents a blending of cultures and communities. The temple will also be open for festival-goers. It is also open to visitors during its normal hours, 9 a.m. to noon and 5-8 p.m. every day (5-9 p.m. during summer). A service is held at 11 a.m. every Sunday. 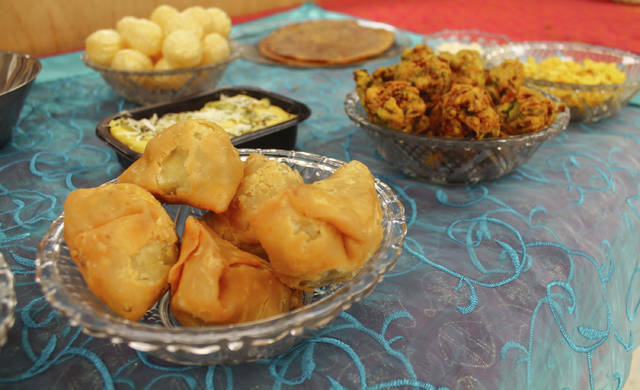 https://www.beavercreeknewscurrent.com/wp-content/uploads/sites/49/2018/08/web1_Food.jpgAnna Bolton | Greene County News Festival-goers will have the opportunity to try all sorts of authentic Indian cuisine at Grand Mela this weekend. https://www.beavercreeknewscurrent.com/wp-content/uploads/sites/49/2018/08/web1_IMG_5743.jpgManoj Kumar, Hindu Community Organization (HCO) President; Dahyabhai Patel, Umang Gujarati Association (UGA) member; Pratibha Phadke, Mela volunteer; Kalpesh Patel, UGA Vice President and Gaurang Desai, Mela volunteer, are inviting community members to Grand Mela, 12-8 p.m. Saturday, Aug. 18 outside the temple. https://www.beavercreeknewscurrent.com/wp-content/uploads/sites/49/2018/08/web1_IMG_5757.jpgThe Hindu Temple will also be open for visitors during the festival.